Cakes & More: Grissini - And The Winner Of The Giveaway! One of the things I do enjoy, but pay relatively less attention to while eating out are the humble bread sticks. I am sure I am not the only one who is guilty on this count. Well, not really anyone's fault as they are mostly placed quite inconspicuously on your table along with breads and dips. You would have savored barely a couple of these and your choice of appetizers land, shifting focus. Not fair at all, I think. 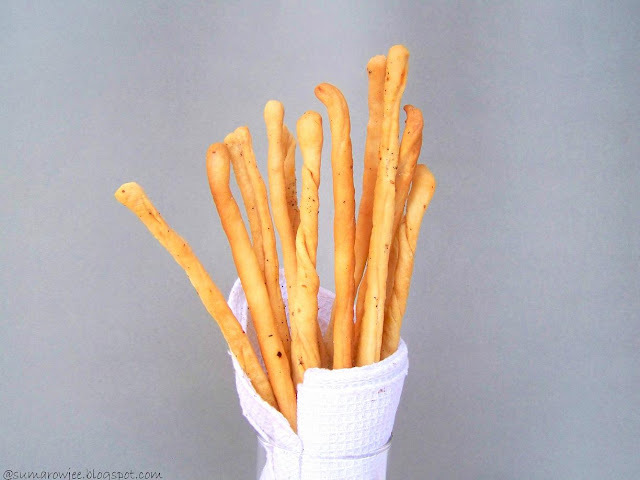 They are just bread sticks but are surely meant to be savored with all the due attention things as crispy and crunchy as these deserve? I have made these earlier, a chewy version with onions and another with part whole wheat which were really good too, but the latter need prior planning with a pre-ferment in the picture. Now it can't really hurt to have a quicker, equally good version in your repertoire...for all those emergency or spur-of-the moment needs for some nice bread sticks. A really simple recipe made with a simple pizza dough, which will take 90 seconds to make in a food processor or with about 8-10 minutes of kneading by hand. The recipe uses water at room temperature and less yeast for a slower rise, meaning better flavor. You could get creative with the toppings and make a variety of these. But be sure to use enough salt in the dough (specially if not using salt as a topping) as inadequate salt may make your grissini taste flat. Sea salt, chilli flakes, zatar, ground pepper, mixed Italian herbs could be a few you can use by way of toppings. The original recipe makes a whole lot of them, I have halved the recipe and saved half of the dough in my freezer to bake a small pizza or more grissini. 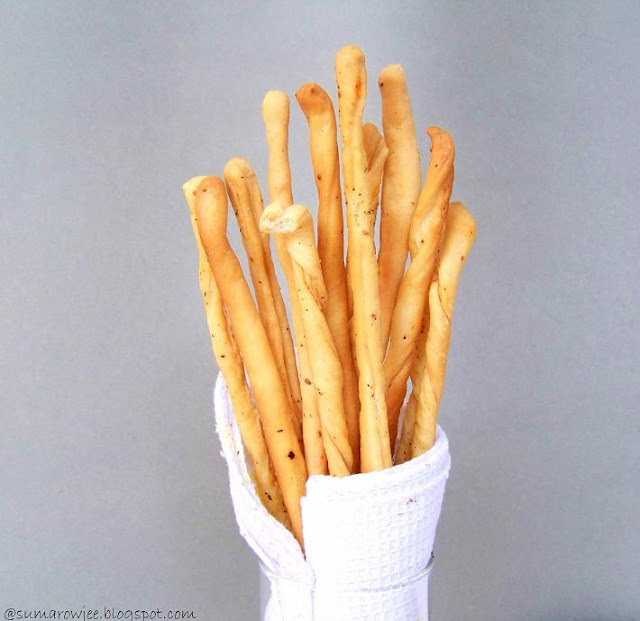 Though grissini is not difficult to make, it does take some time and patience to roll, cut and shape, then bake multiple batches if using the average Indian home size oven. While the dough rises, prepare your baking sheets, line them with parchment. Keep the toppings, some oil, a silicon brush and a pizza cutter ready. Preheat the oven to 180 degrees C / 350F. Divide the dough into two equal pieces. Take one piece of dough, keep the other covered. On a floured counter, roll the dough out into a rectangle to suit the size of your baking tray. I have rolled the dough about 3-4 mm thick, rectangle about 10''/7'', cut into 1.5 cm wide strips. ( Susan makes each of them about 12 x 8 inches, cut into 16 equal strips). As Susan says, the exact dimensions are not critical, but be sure to cut and roll each piece into strips approximately the same thickness and width for uniformity in baking and to help you approximate the baking time for the next batch. Using a pizza cutter, cut the rolled dough into strips of equal width. Remove each strip, place slightly apart. Fold each strip over itself (according to Baking Illustrated, this makes it stronger). On an unfloured surface, roll the strip into a long snake, try to keep the thickness uniform again. Place the snakes evenly spaced across the width of the parchment-lined baking sheet. They won't very dramatically increase in size as you bake, but do not place too close or the sticks will grow into each other, have softish sides. Bake at 350F for 25 – 30 minutes, until light golden brown. Do not let them brown too much. Serve them as is or with your favorite olive oil dip or even marinara sauce. 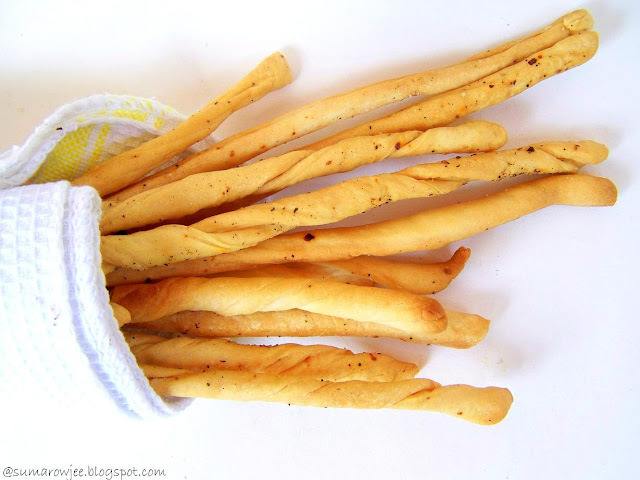 So these grissini from Susan's blog go to Susan's weekly Yeast Spotting! Thanks Susan, you are an inspiration! 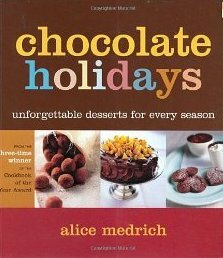 Congratulations Nilanjana and here's wishing lots of chocolate happiness and fun trying out recipes from the book! Please email me your mailing address to sumadotrowjeeatgmaildotcom. The book will soon be on its way! Love the bread sticks. Sorry grissini I am drolling ober them here. Grissini with pesto,just love them..Yours looks fabulous,have to make some. Btw congrats to the winner. Ditto me on your first line on paying relatively less attention to the humble bread sticks while eating out. Your click looks great! Loved the first click a lot. Keep going!